Esther Akumu is the Director of the Department of International Relations in the Ministry of General Education and Instruction in South Sudan. In the latest PoleMag, published by IIEP-Pole de Dakar, she answers several questions on the important role of school in building social cohesion. 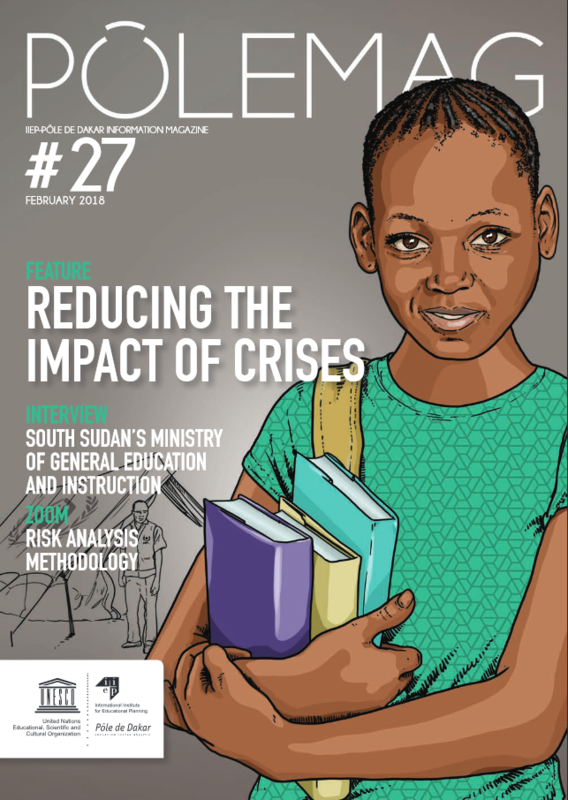 In South Sudan, the Ministry of General Education and Instruction (MoGEI) has developed a Strategic Education Plan 2017-2022, which addresses the issue of risk. Why has this dimension been integrated into sector planning? The recent crisis affecting our country has made us realise that we are not prepared to deal with all the situations. The conflict has forced approximately 1,000 schools to close down and it is estimated that more than 1.8 million children of primary school age have not attended school due to violence across the country. We now know that disasters can happen at any time. We want to be prepared for any eventuality, and know what to do in any scenario. That is why the government decided to integrate risk management into the recent education sector plan covering the period 2017-2022 and to ensure that this dimension is budgeted for. Furthermore, when we observed the work of our partners in education in emergencies, we found that the collaborative dimension was essential to achieving results. Integrating risk into planning has enabled a closer relationship between government and partners on this issue. The development of the Education Sector Plan, led by the MoGEI, brought together a large number of education sector actors at central and local level, civil society, the Education Cluster, UNESCO, UNICEF and UNHCR. This dialogue in itself is very constructive in anticipating crises that may arise. Integrating the issue of risk into planning helps to make school stakeholders more aware of the problems that may arise. The educational community must have the necessary knowledge to face a period of crisis. This awareness is a first step towards effective risk management. How exactly is the strategic plan sensitive to system risks and vulnerabilities? Can you give examples? Various issues directly linked to security and social cohesion have been integrated into the ESP: secure learning spaces, educational opportunities for demobilised child soldiers and out-of-school children, and improved cooperation between MoGEI and its partners in the humanitarian sector. The Ministry has also developed a new curriculum that includes elements of security, resilience, and social cohesion. Work between technical partners and national officials, through practical planning workshops, has helped to inform the technical aspects of the work and facilitate the ministry’s discussions on setting strategic priorities. The active involvement of state and non-state stakeholders has helped to ensure ownership of the planning process. The involvement of humanitarian and development partners is essential to ensure that crisis management is aligned with government priorities. Risk management policy is an integrated process that involves the broadest possible participation of government, partners, NGOs, parents, and students. It is a complex process, but it is the involvement of everyone in the process that makes it functional and effective. What results have been achieved through this approach? Together with partners, we have succeeded in getting many children back into school. Education is not waiting. For us it is a great achievement to have ensured that 400,000 children return to school and that close to 1,000 temporary learning spaces are established through the Back to Learning programme. In the case of internally displaced persons, children continue to have access to education either in refugee camps or in community public schools. It is a very positive process because every child in school learns to live with different people and tribes, who sometimes consider themselves enemies. The school is a sanctuary, a protected area, where children of all origins are brought together in a safe place. In this sense, school is part of the peace-building process: children learn to live together and bring this message of cohesion back to their families. As we implement this programme, public awareness and resilience capacities are strengthened. A fundamental aspect of our risk management policy is to raise awareness among children and that they in turn take the culture of peace with them outside the classroom. What a child learns goes beyond school. That is how the country will change. Read the latest PoleMag issue!